Excelwave Technologies designs and manufactures one to two way, one to three way, one to four way and one to eight way microstrip or cavity type power splitters, in frequency range of 130-2700MHz. 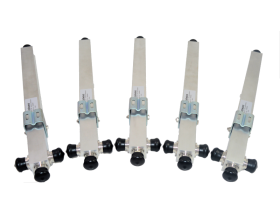 They are designed for low insertion loss, balanced power splitting, compact size and wide band operation. Excelwave Technologies also offers custom designs for broadcast and other very high power applications.Please contact your sales representative or send your custom request to sales@excelwavetechnologies.com.